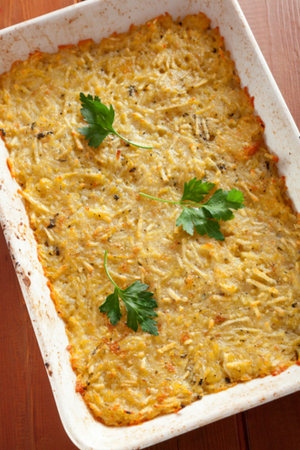 Cheesy Hash Brown Casserole is one of the most popular side dishes served at parties and large gatherings. That is because it is easy to make and everyone loves them! 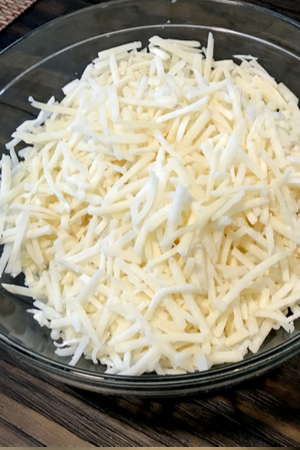 Cheesy Hash Brown Casserole – a favorite side dish for gatherings. I first started to make cheesy hash brown casserole when I was in my early 20’s. It was the first dish that I ever brought to a family holiday meal. I was out of college and living on my own. So I figured that it was about time that I contribute something to the family meal. My first instinct was to bring an assortment of bread and crackers, along with our favorite appetizer dip. Be sure to partially thaw the hash browns so they aren’t in a large clump. However, everyone in my family knew how much I loved to cook and bake. I am sure when I volunteered to bring a dish, they weren’t expecting me to walk in with store-bought bread and a cheesy dip. I caved under what I considered family peer pressure and decided to cook something that took a little more time, but not much more effort. Because I was bringing my first hot dish to a family function, I didn’t want to make anything too complicated. That is when I decided to make Cheesy Hash Brown Casserole. 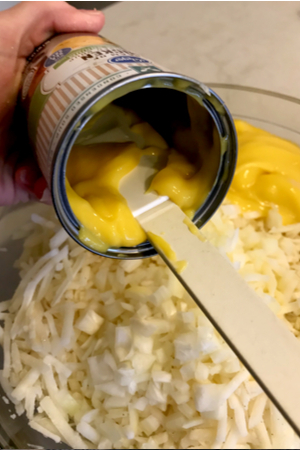 A silicone spatula makes getting the contents out of any can a breeze! I was familiar with hash brown casserole from various events that I had attended over the years. 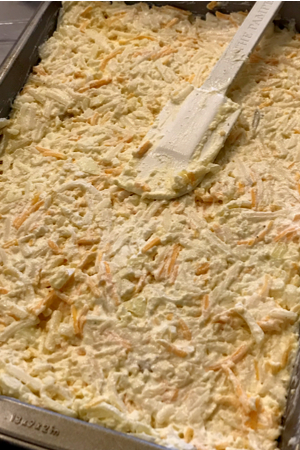 It seemed that no matter what function that I was at, there was always a dish that had some form of a cheesy hash brown casserole on the buffet table. But there was one thing that I noticed. At the end of the night, the dish was always empty! I took the empty dish as a sign that it was a good dish that many people enjoyed. Mix all of the ingredients together and it’s ready to cook! So when one of my co-workers brought it to a work party, I had to ask her what was so special about this cheesy hash brown casserole. She giggled and told me that it was the easiest dish to make! 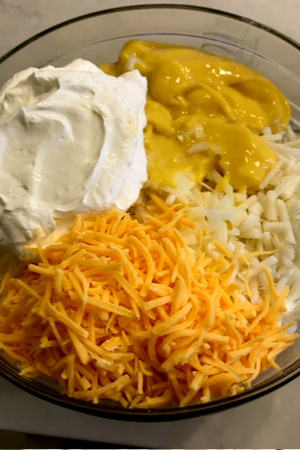 She explained that all it takes is a bag of frozen hash browns, cream of chicken soup, butter, onions, sour cream and cheese. That didn’t sound too complicated! So I gave it a shot and added a little salt, pepper and garlic salt to the mixture as well. For the oven method, spread the hash brown mixture in a 13 x 9 baking dish. I proudly took it to our family holiday party and it was instantly a huge hit! The best part about this cheesy hash brown casserole is that you can adapt it to whatever you like. If I have them in my refrigerator I will add in diced sweet peppers. Or if we are attending an adult only party, I might spice it up a little bit with diced green chiles, jalapenos or some extra red pepper flakes. Cheesy Hash Brown Casserole baked and ready to be served. And there are times when I use Western cubed potatoes instead of the shredded hash browns. They actually hold up well during the baking process and add a different texture as compared to the original variety. But over the years there is one addition that I continue to add each and every time. I sprinkle Panko breadcrumbs on top of the cheesy hash brown casserole before baking. It adds a nice crunch to the dish and it browns up nicely during the baking process. 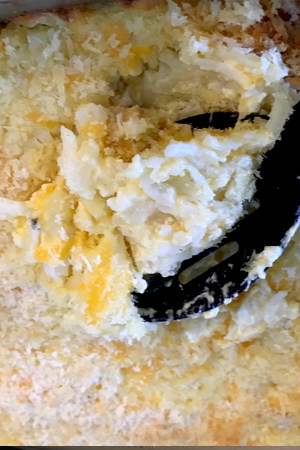 A scoop of cheesy hash brown casserole. 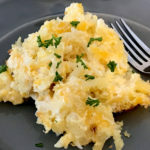 So however you choose to make your Cheesy Hash Brown Casserole, I am sure that it will be the hit of any gathering! 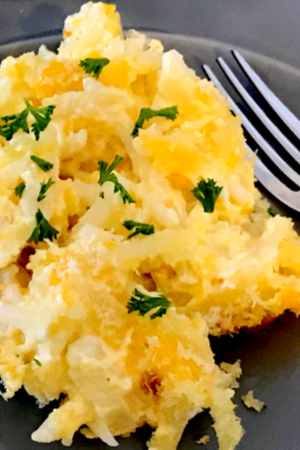 A classic hash brown casserole that is perfect to feed a crowd! In large bowl combine all the ingredients except the breadcrumbs and stir until the ingredients well incorporated. Pour into ungreased 13x9-inch baking dish. Bake 45 minutes or until golden brown and bubbly.